When you spend more than 10 hours a day staring at a computer screen, you’ll welcome anything that can help reduce the risk of eye strain. A cool cross-platform utility called F.lux can do just that. 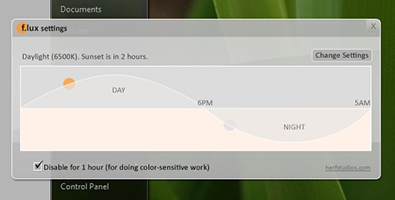 F.lux works by changing the colors of your computer monitor based on the time of day. In the daytime, when ambient lighting is strong, F.lux sets your display to bright daylight tones. At night, when ambient lighting is low or near nonexistent, F.lux switches to warmer tones reminiscent of halogen-style light. As the sun sets, the lighting gradually changes, with barely any perceptible shifts. F.lux uses your network geolocation to detect the current time and set the ambient lighting appropriately. Its default settings are generally pretty good at keeping the lighting soothing, but you can manually change the brightness and type of lighting to suit your preferences. You can also quickly disable the app for an hour from the Taskbar settings menu. I’ve been using F.lux for a few days. The first evening of working in F.lux took a little getting used to, because the warm lighting of the simulated halogen is distinct from the native color palette of the OS, be it Windows, Mac, or Linux. But after a few evenings working in F.lux, I’m really starting to appreciate it. The app is free, so there’s no harm in giving it a shot. And if you’re eager for something to keep your eyes feeling fresh as you work into the wee hours, this little utility might be just the ticket for you.